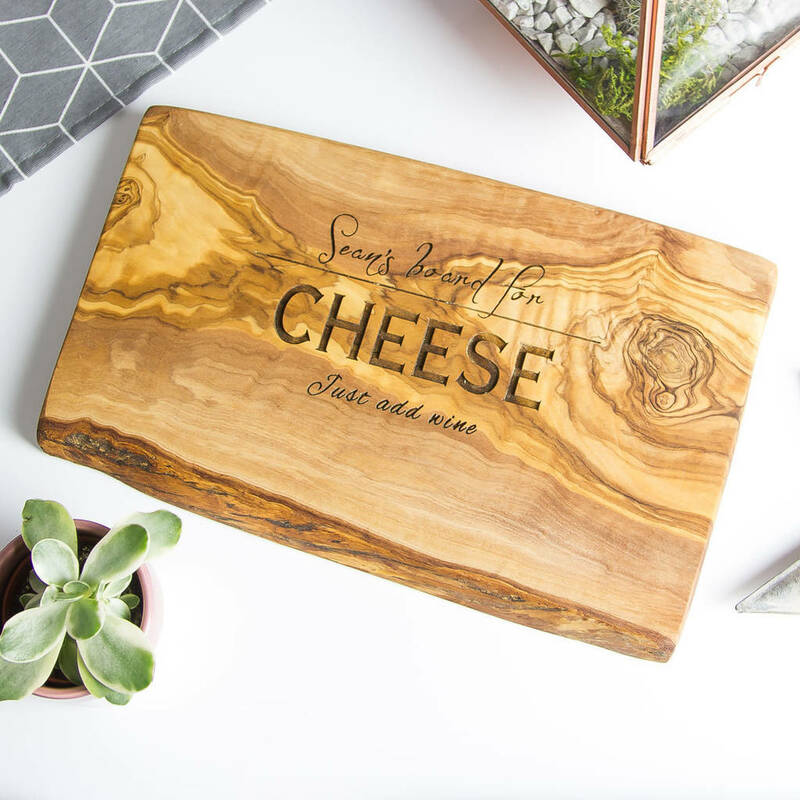 A beautifully designed and unique artisan board ideal for use as a chopping, cheese or antipasti board, made from beautiful olive wood. 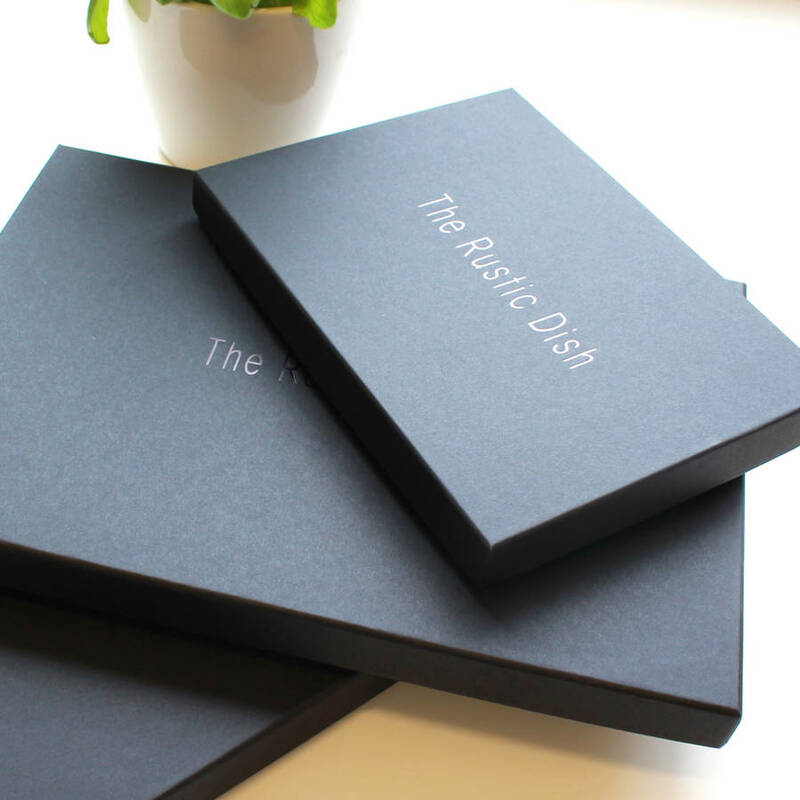 These make great keepsake gifts and mementos for any gifting occasion, including - Christmas, Birthdays, Weddings & Anniversaries (especially 5th), etc. 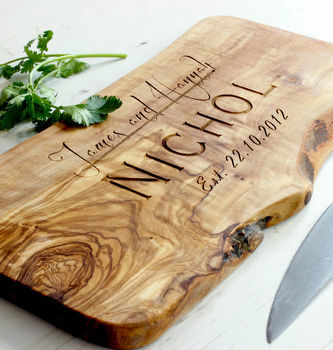 Simply choose someone's favourite quote, names and the date of a special occasion, favourite cheese or cooking quotes, etc. Please bear in mind, the script fonts on the 1st and 3rd lines do not work well when used exclusively with uppercase/capital letters. If you wish to have the heart engraved for the middle line then simply type the word "HEART" in the middle line text box. Personalised engraving: simply enter your text in the boxes provided. If you do not wish to use all three lines then simply enter "Leave Blank" in the relevant box. Spaces count as characters. Cheese Knife Offer! 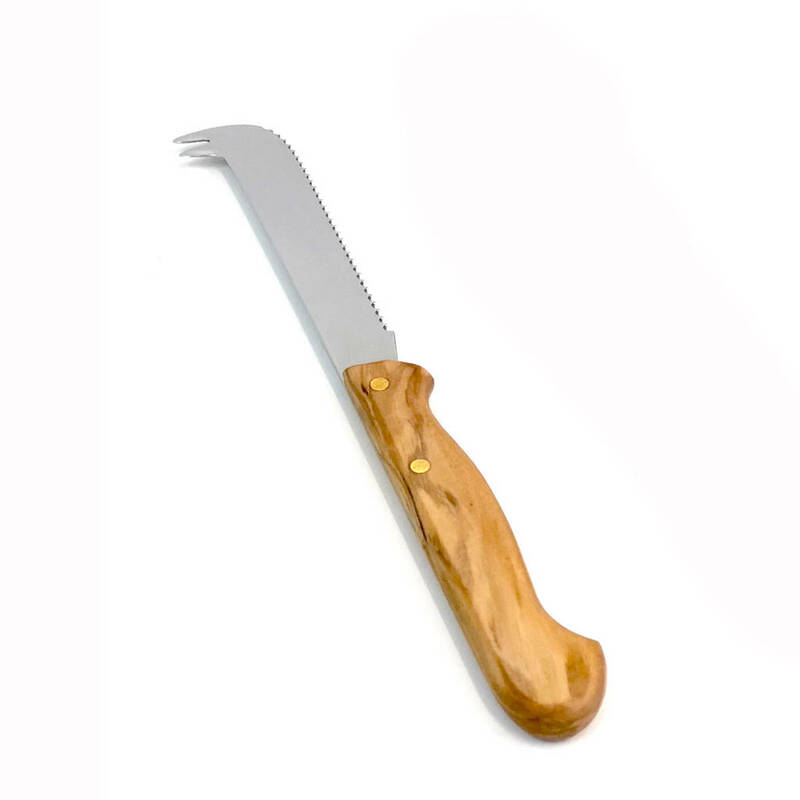 **New Italian made Cheese Knife option available, using beautiful Italian sustainably sourced olive wood. Sold separately for £16, saving £6.00 when bought with any sized board option with this listing. Olive wood is one most beautiful premium woods in the world. Every piece is completely unique with stunning grain patterning and colour and at least one rustic, organic edge. Each board is crafted from a single piece of olive tree. 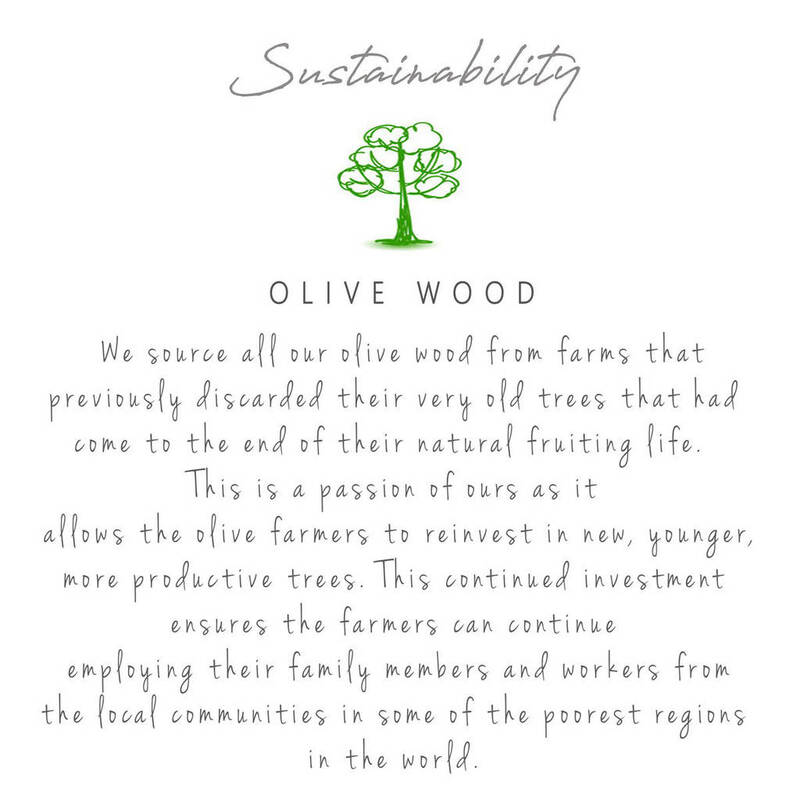 Ethically produced: we only use wood from very old olive trees that have come to the end of their natural fruiting life and have already been replaced with younger, more productive trees. These have been crafted by artisans to a high standard and will last for years. Shapes, colour and grain can vary slightly as each piece unique. 20cm x 15cm x 2cm - perfectly handy for chopping herbs, chillies, garlic, ginger, cheese, etc. 30cm x 15cm x 2cm - great for serving cheese, chopping veg, and as above (MAIN IMAGE). 40 x 17 x 2cm - great for carving meat, bread and all the above! 50 x 20 x 2cm. Just bigger and better!